Many years ago I moved from teaching intermediate down to primary. I worked closely with another teacher who had been using money in the classroom for years. I was hesitant at first, but quickly realized that if we would be sharing students throughout the day, I would need to jump in with both feet and get started. Now it seems like second nature, but it wasn’t always the case. Here’s a look at some of the questions I had when I first started and I hope it might help you, too. Not only can money be an incredible motivator for even the most reluctant student, but there is a wonderful opportunity to teach some real-world lessons as well as create learning opportunities. I primarily use a classroom economy to teach basic financial literacy and to manage and reward student behavior. I am a teacher who LOVES alliteration and am fortunate to have a last name that works well with the word ‘bank’. In my bank I have $1, $5, $10, and $100 bills and each bill is copied onto a different color of paper. I find these denominations are highly appropriate for second graders who need practice skip counting and making change. I have contemplated making $20 and $50 bills to coordinate with real-world money and might just do so when I create my new bills (not to mention splurging on some Astrobrights copy paper). Each bill is about 2-in. x 5-in. in size. All of my bills are kept in two containers purchased from The Dollar Store. 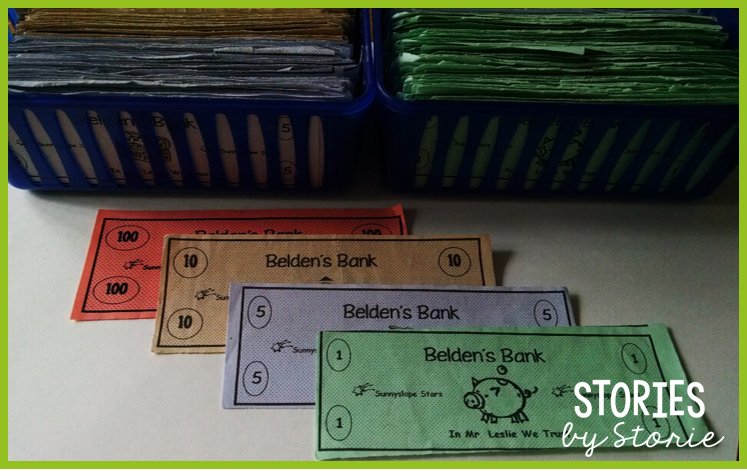 I have also tried storing them in pencil boxes (the same ones my students use), but I found that the money would slide around or I would have some bills facing one way and another stack on the end facing a different way. It just bothered me. This is where the real-world lessons come in. How do adults make money? They are paid for doing their jobs (you can read more about how I use classroom jobs here). Throughout the week, students can earn money for any number of things. For example, students who hold classroom jobs each week earn money on a weekly basis according to the payroll. Money is also earned for following rules, showing good character, putting extra effort into school work, and being responsible. It’s also important to note that money can be taken away when a student chooses not to follow the classroom rules. During the day I will carry money around in my hand as I walk around the room. I will quietly lay money on student desks as I observe the behaviors I am looking for. When I am at the document camera and I need to give out money, I will say a student’s name, hold up the bill, and continue teaching. It might seem strange that I don’t use tally marks, but I’m usually making marks while teaching so I don’t really look at the clipboard very carefully other than to find the right name. I will note that most of my -1 marks are because a student was talking or off-task during my lesson. 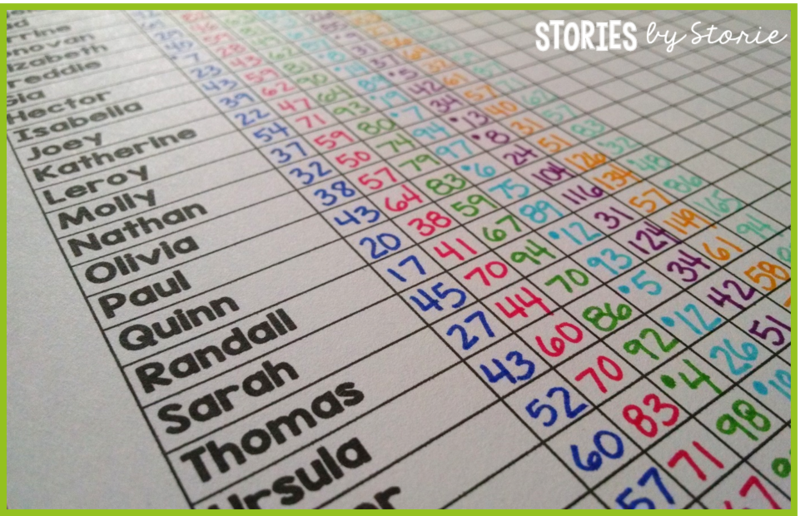 Some of the 5 or 10 marks you see are usually because that student received a compliment from an adult in the building – that’s a big deal in our classroom, so it earns more money! 1 – I need to know how to set my prices for my rewards (more about that later). If the average student only has $100 earned, I cannot be charging $500 for every reward. Likewise, my prices cannot be $5 or I will be going crazy trying to keep up with rewards. 2 – Thieves. Yep, you read that right. Sadly, I’ve had more than one over the years. Yes, sometimes money is found on the floor and it is hard to determine whose bank it fell from. However, one year my best students kept telling me their money was gone, but couldn’t prove it. Then one day it was time for students to cash in for the student market (more about that later). One of our volunteers stepped in the classroom to tell me that one of the students had almost $2,000, when most of our top earners only had $400-$500. Ummm….RED FLAG. Needless to say I am very careful about record keeping now. I’ve used three different types of “banks” for my students over the years: small, white envelopes, medium-sized manila envelopes with clasps, and library pockets. All of the options were always laminated and the slits cut open so they would last all year. Each had their pros and cons and varied with each class of students. In the picture below, the student on the left has a manila envelope. The students on the right have small, white envelopes. This one has definitely evolved. In the beginning my teaching partner and I held classroom markets once a month. These were very elaborate and required the help of some dedicated volunteers. We had donated and gently used items for sale. We also purchased some special items to sell, too. Let’s just say this was a very expensive, monthly activity. We also had special student markets twice a year. During the first round, half of the students were producers and the other half were consumers. For the second round the roles would reverse. 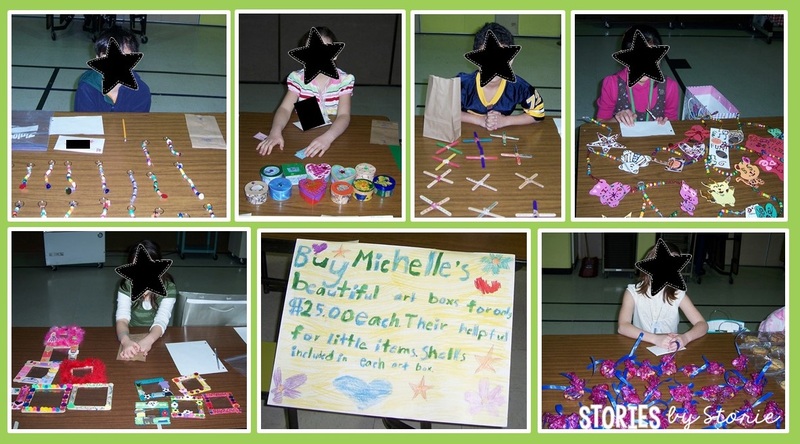 Each student was responsible for creating a product to sell (about 1-2 dozen), determining a price, and creating a store poster for advertising. We would set up shops in the cafeteria and invite adults from the building to come shop for new goods. It was a great learning experience about supply and demand. Some students sold out quickly because they had an amazing product. Others would hardly sell anything because their prices were too high or their product wasn’t in demand. Either way, it was a great way for students to earn and spend money that didn’t come out of our pockets! After I took a year off to be home with my little girl, I came back to teaching second grade by myself. I wanted NEEDED to use classroom money to keep those second graders motivated to make good choices. My priorities had changed and I just couldn’t dedicate myself to a monthly market financially or professionally. I needed to come up with some free or low-cost rewards that my students would enjoy. So, I created my Classroom Reward Coupons (yep, they’re free on TpT). I use a pocket chart and put the coupons in for display. I then put sticky notes with prices on the front. Why sticky notes? Great question! In the real-world, prices are always changing due to supply and demand. So in my classroom, prices change with supply and demand, too. For example, if several students want to purchase a coupon to sit on the floor with a pillow for the day, the price will soon go up because I have a limited supply of pillows. If it didn’t, I would have to start a waiting list! I hope that answers some of your questions about how I use classroom money in the classroom. Let me know if there’s anything else you would like to know about my system! Update – Good News! 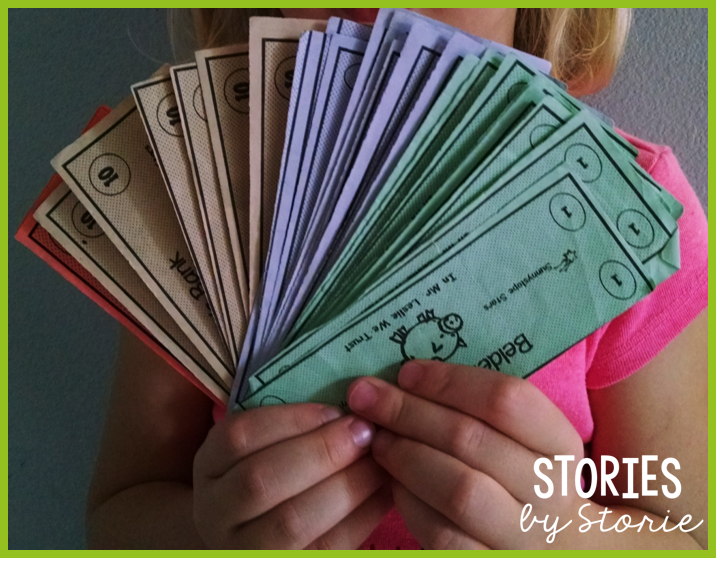 If you’re thinking about using money in your own classroom, you might be interested in this set of editable classroom money. I love your plan about classroom money. In fact, I'm probably going to start that this year with my second graders! 🙂 Parent communication is of huge importance at my school so I use Class Dojo to kill 2 birds with one stone. Do you think there's any way to couple Class Dojo points with your idea of earning money through classroom jobs?? I have never used Class Dojo before, so I'm not really sure if there's a way to combine the two ideas. Sorry I can't be of more help! I think you could use the points in Class Dojo as equivalent to money. Maybe for every positive point they get they get $1 in classroom money. I use ClassDojo for my Rash Cash and parent notification. I have 6th graders though. By now, I expect them to do the right thing. So ClassDojo is only used for violations. (Needs Work). Students can earn $20 in a day, $100 a week with a $10 bonus for a perfect week. Money is deducted from $100 for the week based on ClassDojo points. Parents must acknowledge the money lost (by ClassDojo points) before students will be paid. This ensures that the parent communication piece is successful. In order to "catch them being good" since I don't do that on ClassDojo, I walk around with $5's and $10's or call out a student's name and have them come and get it while I'm teaching, to ensure that all students are participating and/or meaningfully engaged. I also use SWAG (Brag) tags for this purpose. I used classroom money with my students years ago. 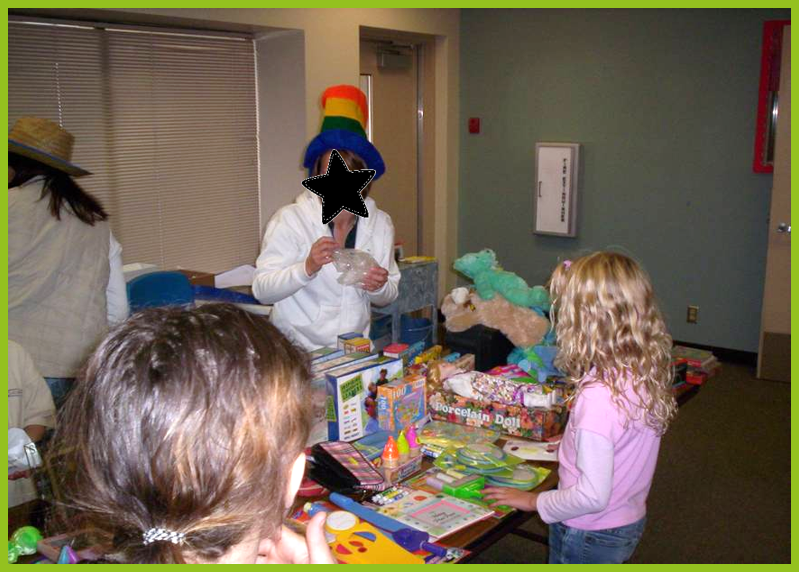 We had an auction every so often. (Can't remember exactly as I retired in 1994 after 30 years in education.). We had some bought items like a 64 oz. bottle of Pepsi as well as donated used items. It was a great motivator! I highly recommend it! 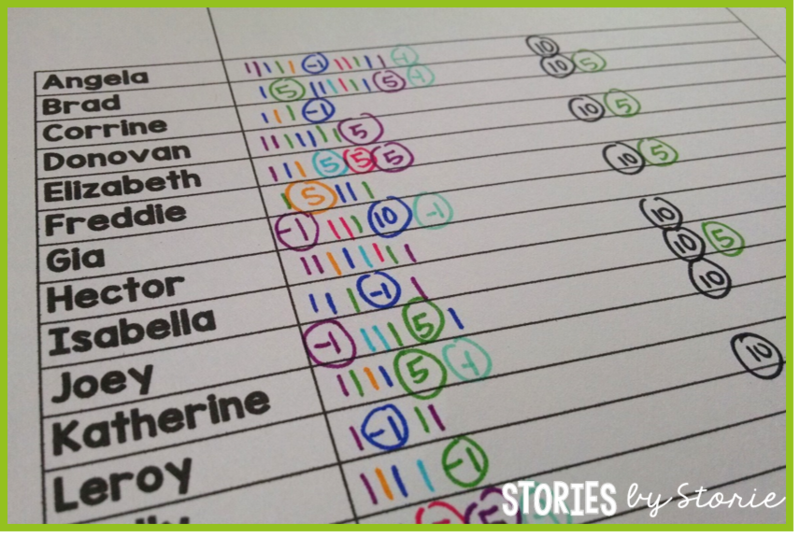 Hi, I absolutely love the earning money idea for classroom mgmt. I teach 4th graders & I plan to implement it and the idea on the non-monetary coupons as rewards. Thanks for sharing your wonderful ideas. I work with an after-school program that uses a similar system for behavior reinforcement and teaching money management/responsibility. I’m finding that the kids lose their money often. 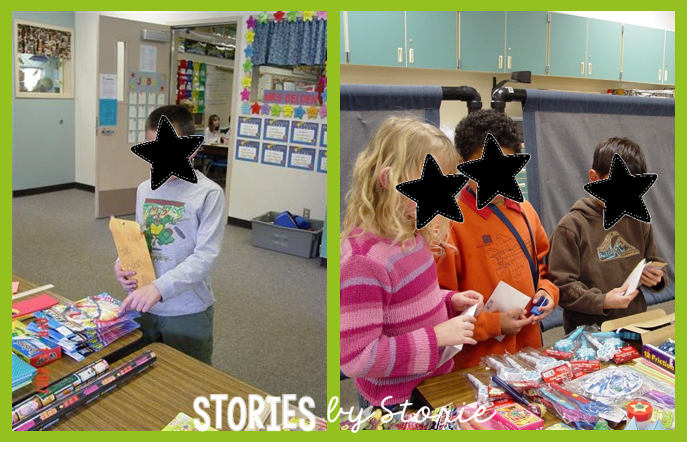 The organization has never kept envelopes or library pockets for the kids here because they were afraid this would detract from the kids learning responsibility–so the kids would take the money home and then lose it. Do you find that keeping the money at school detracts from learning responsibility? What aspects of this system are you finding are the most crucial for success (consistency in giving the money, frequent opportunities to use their money, etc.)? Thanks for a great article/post! Thank you for your interest in this post. Since I used the money in the classroom, it seemed fitting to keep the money in the classroom. I did not find that it took away from student responsibility because students were still held accountable for keeping their money in their envelope, organizing the money, and counting the money. Since classroom money had no value outside of the classroom, I didn’t feel there was a need for it to be taken out of the classroom. In order to maintain success, I felt I had to be consistent with handing out the money. Students always knew that certain things would be paid for on Fridays. However, to use the money as a behavior incentive, it made a larger impact when I carried around a small stack of money and handed out bills on the spot. It is up to teacher preference for how often to have a student store where students can spend their money. For me, it made sense to do this about once a month so students had enough time to earn money. Thank you so much for your quick response! You sharing your experience in this is greatly appreciated! I hope it helps make our token economy a more positive experience for myself, the staff, and the kids too!